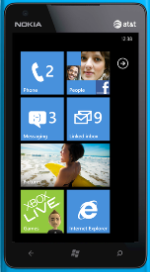 Smartphone-on-the-cheap alert: The Nokia Lumia 900 is now available from AT&T for only $50 with a two-year contract. Nokia's flagship phone running Windows Phone 7 Mango won't be able to upgrade to the Windows Phone 8 operating system when it becomes available later this year, but the high-end LTE handset is still a relatively impressive device. Bells and whistles include competitive specs, a beautiful user interface, and a classy design. PCWorld's Ginny Mies just a few months ago called the Nokia Lumia 900 "the best Windows Phone so far" and said it has the chops to stand up against the Android army as well as the Apple iPhone 4S. The one downside is that many people aren't familiar with the Windows Phone experience. My current phone is a Samsung Galaxy Nexus and before that I was toting an iPhone around, so when I recently tested the Lumia 900, I found its Metro user interface refreshingly different. Whereas iOS and Android screens display small app icons, Windows Phone instead gives you larger live tiles that update in real time. For instance, there's a "people hub" tile that lets you click on a contact and see all of your latest interactions with him or her and you can pin important people in their own separate tiles so as to see new emails, texts and comments on social networks from them. You can also pin to the start screen a group of contacts -- for example, your family or team members at work -- so you can email, text or chat with them all at once. In these ways, Windows Phone feels more social than iOS and Android and with back-to-school season ramping up, the Nokia Lumia 900 is a great bet for socially-savvy young people, some of whom might dig the new pink version Nokia just debuted. And while people always want to point to the fact that Microsoft has far fewer apps in its Marketplace compared with Google and Apple, most of the top apps in the other ecosystems are available for Windows Phone users, and some of them are simply fantastic, such as Nokia's Drive app, which gives you excellent voice-guided, turn-by-turn GPS navigation. Here's the rub: When Windows Phone 8 debuts this fall, it will feature a slick new camera app, Internet Explorer 10, near-field communication, Nokia Maps, Direct X support for advanced gaming and multicore processor support. If you buy a Nokia Lumia 900 now, you'll miss out on most of these features. Even so, for the price, the Lumia 900 is still worth looking into. When I tested it in many ways I would have swapped it for my Galaxy Nexus -- a telling clue the phone is cool. Find out more at Nokia's blog.